This was going to be a busy week anyway. Multiple commitments, a friend coming into town, and some critical tasks as I am involved in preparing for two different fundraisers for two of the boards I sit on. So, a carefully orchestrated event was severely impacted by Mother Nature with only hours in which to respond. Several phone calls and quite a bit of scrambling, FB messages, and emails flying about that day and the next in setting up a new date. That, of course meant me being unable to attend an already scheduled event on the new day, but we’ll split, and Hubby will go to the function before he joins me at the rescheduled one. The out of town friend in for a visit comes with the usual tasks of cleaning in prep, etc., and a couple of bedtimes later than usual, which doesn’t actually help with my insomnia. Related to dining out, I’m trying to decide how to creatively use some of the leftovers. Not a big deal, simply something to think through. Next we have a crisis develop in another non-profit I work with, and it’s too complicated to get into, plus at the moment, we appear to have only bad choices. This is never a situation I like to find myself in, and yet, it’s not the first time either. Experience in such matters does help. I can delay things for a short while and hope a better solution falls from the sky or whatever. On the other hand, there is absolutely no way I need to be concerned about getting bored. And to put things into perspective, two different friends have asked for prayers as members of their respective families have been entered into hospice and another friend is giving updates on the state of her daughter (several years younger than me) who is recovering from a stroke. I’m going with “Third time’s a charm” on this particular project. A few years ago I did a post about the Verde Garden Market in Homestead close to Homestead Air Reserve Base. There are 22 acres and a farmers’ market adjoins it. They had completely refurbished the market to add a commercially approved kitchen and an area where they could serve food, put in a number of picnic tables and display area for art as well as places for the fruits, produce, and a couple of refrigerator cabinets. I was so excited when I toured and told as many people as I could. Unfortunately, things never took off, nor did the next try at it. Support the training of underserved populations and Veterans to become farmers & explore careers in Agri-business in programs offered by FIU and UF (TREC). The main farming program provides up to a year of training and then the opportunity of a low-cost lease on acreage to begin farming. In general, the individual starts with approximately one-quarter acre and can expand up to four acres. The products can then be sold at the Redland Community Farm and Market at Verde Garden and other venues. The commercial kitchen option is available for someone who may not be interested in farming, but may have a talent for, and desire to be in, a culinary career. Small batch producers who create baked goods, candies, jellies, and so forth can use the kitchen at the market and sell there. Perhaps someone wants to develop their own line of sandwiches, soups, or other hot items, and operating a food truck or opening a café is not feasible. A part time arrangement at the market is a workable way to begin. Currently, Tuesday through Thursday 12:00-4:00 p.m., is when Phillip Bryant and Veronica Valdivia are on-site with Johnnie’s Pit BBQ. Since the market is open seven days a week, other food vendors will be welcome. 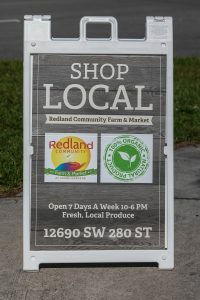 Redland Community Farm and Market is open 10:00 a.m. to 6:00 p.m., seven days a week. Twice monthly Friday night events are also held with extra art, music, and food choices. The purpose of the Friday night events is to extend the regular hours from 6:00 – 10:00 p.m. and help spread the word about the market. A special note, as of this post, is road construction at 127th which was the most direct route. The detour is from 288th onto 132d through a residential area to SW 280th St. Detour signs are posted. No, there’s not a punchline here; merely one of those odd events that occurred when we were in Saudi Arabia for Desert Storm. As I’ve mentioned in previous posts, Hubby and I were assigned to the same very large organization that provided logistical support, to include water production and distribution. That actually is another subject, but when people think of what it takes to equip and support a large fighting force, ammunition, fuel, food, and maybe medical support come to mind, rather than something like water. Each country, however, can have different foodstuff requirements for their personnel. Americans for example, include pork products in rations, whereas Muslim units obviously do not. Anyway, French troops were part of the Coalition put together to defeat Saddam Hussein. Our unit was set up out in the desert about 150 miles toward Kuwait, although not very close to the border. After the “Lightning Victory”, forces were drawn down as quickly as they could be and redeployed back to their respective countries. That, too, is a massive effort and in some cases, items needed during the war were left behind for different reasons. Now, I wasn’t in the location where this particular event took place although the individual who told me about it was generally accurate. Large metal shipping containers that get loaded on trains and ships come in two standard sizes of 20 feet and 40 feet long. They are about 5 feet high – maybe 6. Apparently, part of the French logistics support was Perrier in the small green glass bottles and for whatever reason, they had two 40 foot containers packed full they decided not to ship back. (It was probably a matter of available transport.) They simply turned the containers over to our guys and next thing we know, little bottles of Perrier are being distributed among a number of our units. Now, it so happens as we relocated out of the desert and into the edge of a major Saudi Arabia military complex, an ice plant was part of the complex. Not surprisingly, shipping ice out to our units was greatly appreciated and for the remaining several weeks, we had a pretty steady supply of ice. I will admit, swigging iced-down Perrier while winding up desert operations wasn’t something I expected to do. On the other hand, it is a memory that’s stayed with us. The Staple of Hamburger Helper…. Okay, if you are utterly opposed to boxed meals, go ahead and skip this post. It isn’t even exactly in praise of Hamburger Helper, but rather some amusing anecdotes. I don’t know the history other than it was created in 1971 and was probably considered an “advancement” for busy people and those who were perhaps limited in culinary ability. After all, being able to brown hamburger, measure milk, stir in the other few ingredients in the box, and keep from burning the dish isn’t too challenging. A fairly complete meal in a single pan is welcome when it comes to clean-up. I don’t recall when I did prepare it the first time and as with many of these conveniences, adding ingredients such as onions, peppers, a few more seasonings does give more depth. Hubby is in fact a fan although one of the only versions I don’t care for is the classic Cheeseburger – his favorite. That’s one of the dishes he often makes for himself when I am on a trip. We will be having the Stroganoff this week on Thursday because that’s Camera Club meeting for him and it’s easy for me to have dinner at normal time and him to zap in the microwave when he gets in much closer to nine o’clock. That’s the version with the noodles, not the potatoes. I’ve posted before about Homestead Center for the Arts and the range of things we are involved in. Five years ago (another of the, “Can it really have been five years ago? Yep.”, moments) a somewhat casual comment turned into a program for bringing different genres of music 2-4 times a year into Homestead. At that time, few restaurants featured live music although a couple are now doing so regularly on weekends. Not surprisingly, the main type of music played is the 1970s+ and lots of Jimmy Buffet tunes. So the Music Series (MuSe) of HCA looks for other genres; as local as possible, which means no further north than Miami. We don’t have a large budget, plus the idea is to highlight local talent. Last night’s (Thus, Jan 17th) group of Sonny East was superb and a few people, to include the director for Seminole Theatre, took their contact info. The courtyard of the White Lion Cafe was perfect, even though I did put my sweater on the latter part of the night. It was fried broccoli for the table as a starter, then I had the dolphin dippers and hubby went for the blackened prime rib. Anyway, back to music. I am not enough of an aficionado to hear the difference in Delta, Chicago, Memphis, or Saint Louis Blues. I know there are regional aspects and perhaps if i heard examples back-to-back I could pick up on the variations. We haven’t decided yet what our next performance will be and we do have a group that loves the classical string trio or quartet in from Frost School of Music (U of M). And as odd as it seems with so much Latin influence around, we have yet to locate a good Latin Band within our price range. The search shall continue. And More Days Slip By….. Most decorations have been returned to their storage spot, although somehow, what appears to be the single addition of one item given as a gift now necessitates needing a box for it and three others. Apparently not everything went exactly back into the usual place, but we do also have boxes around the correct size. Leftovers have been consumed, tossed, or give away appropriately and when I pick up a pie crust tomorrow, an apple tart will complete the last of them. I don’t think there is enough apple for a full pie, plus there is still extra chocolate candy in the pantry. Small pieces, granted, yet candy nonetheless. My lack of posting is an indicator of what the schedule has been like and not surprisingly there is no real let-up in sight. On the other hand, boredom is hardly an issue we need to be concerned with. I did manage to fire off an email to the fence company we will probably use to finally get that back in order which is the required step before contacting the landscaping lady. It so happens the big Seafood Festival will be the last Saturday and Sunday of Jan and last year, she had a booth there. This particular fence company tends to work fast if they are available and thus, it is possible, they will either be finished or have a completion date for us by that time. If she is at the Festival again, it will be a much shorter visit to talk to her than going out to her place. It isn’t really that far, but hey, every shorter errand does help. Anyway, a very busy week ahead. In all the excitement, our only disappointment is it seems as if the hummingbird we so happily celebrated has gone away. It’s been several days with no sighting or apparent activity. Perhaps he was migratory after all. However, if we finally had one, another many well appear. Keeping fingers crossed. First, Happy New Year. Today is the last day for the kids to be here and I am hoping for a little more sunshine and less wind for our final pool time. Ah well, hot coffee and cocoa are to be had. For our annual New Year’s Eve party, we invite a limited number of people because we don’t want anyone to drive far. The one set of friends lives about two miles away with only a few turns in between. The others are even closer. We also started a new tradition last year. We begin the party at 7:00 and at 9:00 we toast New Year’s in Brazil; at 10:00 in Argentina; at 11:00 St Croix, and midnight here, of course. That way if anyone wants to leave early, they have already raised a glass in toast. I wanted to include Iceland or Greenland, just because, but they’re too far ahead of us. It works well and by the same token, if someone wants to come later, we’ll have the festivities going until midnight. Hubby had to work today and tomorrow, so there wasn’t much sleeping in although he did have a slightly later start. Granddaughter tried to stay awake last night, but did get a bit wired so she finally gave in and got into her nightgown. She did sleep in a bit this morning, too although not very late. I am slowly recovering the house and one of the rules I have for the party is nice paper plates and high end disposable cutlery which includes no food that requires cutting so you don’t get into the issue of that. Even though there is still quite a bit to clean and rearrange, big garbage bags take care of much of it. Closing again with Happy New Year and hope it is a good one for all. So, when we were in Georgia for Thanksgiving and Hubby’s cousin said she had used a dry brine this time, he was intrigued. The turkey was excellent and we are giving it a try. It’s a two-part process of mixing the kosher salt, sugar, pepper, etc., together to completely cover the bird, but placing it on a wire rack on a baking sheet uncovered in the refrigerator overnight. Part two is to place an apple into the cavity, mix unsalted butter with more herbs and spices and rub that mixture all over the turkey before roasting at 350 degrees. Tonight we will be making a modified version of “siete potencias”; a seafood stew traditional in Puerto Rico and other places as the Christmas Eve meal. The origin is apparently African although I’ve never really checked into that. There are of course regional variations and we have done the full seven-ingredient version. With only the two of us though that makes for a lot of stew and it doesn’t keep for more than a few days. Since the kids don’t arrive until Dec 28th, it’s just easier to have less leftovers as I’m stocking the refrigerator for what we’ll have with them. I have to admit a nation-wide (or maybe it’s global at this point) ban on romaine lettuce was not something I anticipated. As much havoc as it is causing in our personal shopping, I feel terrible for restaurants who have moved away from ice berg lettuce in favor of romaine as being more upscale and popular. There are many who do the “classic wedge” though so I guess that works if they can get adequate supply. It appears that field greens and of course spinach are safe, but again, romaine does tend to be a greater percentage of the trade. This brought to mind our time in Desert Shield/Desert Storm when fresh vegetables simply weren’t available. We did get some fresh fruit such as apples, oranges and tangerines, and figs (which I don’t eat). There was also fruit juice. Lettuce was simply too perishable and in the huge quantities of food needed for military rations, the big cans of vegetables are what are used. The Meals-Ready-To-Eat (MRE) as rations have some vegetables in items like Chicken A La King or Beef Stew, but at the time, that was about it. I know they’ve done a number of changes with the menu since then so there may be more options. Anyway, when we did finally return to Germany, it was mid-May so the growing season was in full swing. That meant no shortage of lettuce and for at least a while it was strawberry season. Their strawberries are always delicious and especially so that summer. I’ve always loved the white radishes although at the time I was not a fan of white asparagus. There were naturally other culinary items we’d missed such as the wonderful pastries and we caught up on those as quickly as we could. Not surprisingly good German beer and wine were in the liquid category. I’ve written in previous posts about the town square of Covington, Hubby’s home town. We always have lunch one day there and I then stroll around as he goes to take photos. The New Orleans-themed restaurant was closed, as does happen the day before Thanksgiving and we were already scheduled to have dinner at Mystic Grill with his sister and her husband. The “Fish Camp” place close to the square is being converted into a Japanese place and unfortunately, the Irish Pub didn’t succeed either. We went to the Your Pie which has pizza, paninis and salads. As an aside, the romaine lettuce recall is causing issues for restaurants and diners alike. Anyway, Your Pie is unique in it is set up similar to Subway. They serve 8-inch thin crust pizzas and you pick from a variety of crusts and toppings or you can order one of their creations. They do give you a number and bring your order to the table. I went with whole wheat crust, marinara, pepperoni, salami, sun dried and fresh tomatoes. Hubby had a turkey and pesto pannini. After, he went off with his camera and I went to the Town Square Olive Oil shop. We haven’t been down to our Olive Morada for longer than we like, but we aren’t going to deal with holiday traffic. I had to restrain myself in stocking up, but how is one to resist cilantro and roasted garlic infused olive oil and I had to have blood orange and Persian Lime. Then there was the new bacon and I did stop at that. The Cork wine store was open as well and they did have the Nouveau Beaujolais in. Not for us – that was the gift to give Hubby’s cousin who hosts Thanksgiving. Then there was time for coffee at the Bread and Butter Bakery and I very carefully ignored the pastry section. It was a lovely afternoon and a sweater was enough warmth since the temperature didn’t drop much until after the sun went down. Not Knowing What You Don’t Know….